Mission specialist Sally Ride became the first American woman to fly in space. Sally's first ride, with her STS-7 crewmates. In addition to launching America's first female astronaut, it was also the first mission with a five-member crew. Front row, left to right: Ride, commander Bob Crippen, pilot Frederick Hauck. Back row, left to right: John Fabian, Norm Thagard. 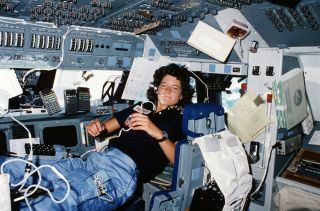 On June 18, 1983, 35 years ago, Sally Ride became the first American woman to launch into space, riding the Space Shuttle STS-7 flight with four other crew members. Only five years earlier, in 1978, she had been selected to the first class of 35 astronauts – including six women – who would fly on the Space Shuttle. STS-50 Crew photo with commander Richard N. Richards and pilot Kenneth D. Bowersox, mission specialists Bonnie J. Dunbar, Ellen S. Baker and Carl J. Meade, and payload specialists Lawrence J. DeLucas and Eugene H. Trinh. The photo was taken in front of the Columbia Shuttle, which Dunbar helped to build. I graduated with an engineering degree from the University of Washington in 1971 and, by 1976, I was a young engineer working on the first Space Shuttle, Columbia, with Rockwell International at Edwards Air Force Base, in California. I helped to design and produce the thermal protection system – those heat resistant ceramic tiles – which allowed the shuttle to re-enter the Earth’s atmosphere for up to 100 flights. Mike Anderson and Bonnie Dunbar flew together on STS-89 in 1998. They both graduated from University of Washington. Anderson was killed in the Columbia accident, in 2003. Sally and I arrived at NASA at the same time in 1978 – she as part of the “TFNG” (“Thirty-Five New Guys”) astronaut class and I as a newly minted mission controller, training to support the Space Shuttle. I had already been in the aerospace industry for several years and had made my choice for “space” at the age of 9 on a cattle ranch in Washington state. I also applied for the 1978 astronaut class, but was not selected until 1980. Sally and I connected on the Flight Crew Operations co-ed softball team. We both played softball from an early age and were both private pilots, flying our small planes together around southeast Texas. We also often discussed our perspectives on career selection, and how fortunate we were to have teachers and parents and other mentors who encouraged us to study math and science in school – the enabling subjects for becoming an astronaut. In January 1978, NASA selected six women into the class of 35 new astronauts to fly on the Space Shuttle. From left to right are Shannon W. Lucid, Ph.D., Margaret Rhea Seddon, M.D., Kathryn D. Sullivan, Ph.D., Judith A. Resnik, Ph.D., Anna L. Fisher, M.D., and Sally K. Ride, Ph.D. Although Sally was one of six women in the 1978 class, she preferred to be considered one of 35 new astronauts – and to be judged by merit, not gender. It was important to all the women that the bar be as high as it was for the men. From an operational and safety point of view, that was also equally important. In an emergency, there are no special allowances for gender or ethnicity: Everyone had to pull their own weight. In fact, it has been said that those first six women were not just qualified, they were more than qualified. One of the topics that Sally and I discussed frequently was why so few young girls were entering into math, technology, science and engineering – which became known as STEM careers in the late 1990s. Both of us had been encouraged and pushed by male and female mentors and “cheerleaders.” By 1972, companies with federal contracts were actively recruiting women engineers. NASA had opened up spaceflight to women in 1978, and was proud of the fact that they were recruiting and training women as astronauts and employing them in engineering and the sciences. As part of NASA's commitment to the next generation of explorers, NASA Ames collaborated with Sally Ride Science to sponsor and host the Sally Ride Science Festival at the NASA Research Park. Hundreds of San Francisco Bay Area girls, their teachers and parents enjoy a fun-filled interactive exploration of science, technology, engineering and mathematics on Sept. 27, 2008. Sally Ride and Bonnie Dunbar are fighting outdated stereotypes that women are not good at STEM subjects. Both Sally and I had wonderful careers supported by both men and women. NASA was a great work environment and continues to be – the last two astronaut classes have been about 50 percent female.